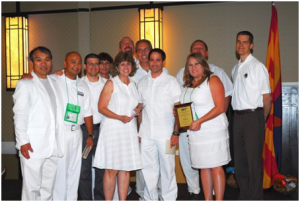 A warm thank you to the Local Arrangements Committee for hosting an outstanding Annual Meeting in Phoenix in July! The committee was chaired by Kim Carroll, assisted by vice chair Andrew Smigielski. They were supported by Alejandro Angel, Cathy Hollow, Chris Williams, Dan Hartig, Jenny Grote, Kim Konte, Randy Dunsey, Ray Yparaguirre, Scott Kelley, and Sylvia Mousseux. Excellent job! The meeting’s compendium of papers has been posted here.